With cold and flu season in full swing, it is important to take as many precautions as possible to avoid these illnesses. Although most people recover from colds or the flu fairly quickly, either illness could lead to bronchitis or pneumonia. While both bronchitis and pneumonia are infections of the lungs, there are important differences between the two conditions. Understanding these differences is crucial for seeking the proper treatment and getting back on your feet as soon as possible. Acute bronchitis. This form of bronchitis lasts just a few days and typically goes away on its own within a week because most bronchitis is viral. Other bronchitis can be due to bacteria and may progress to become pneumonia. 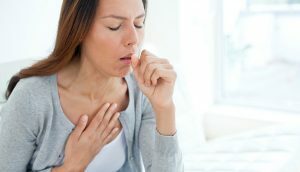 Treatments, such as Ibuprofen, Tylenol, cough medicine, and inhaler are usually only needed to manage acute bronchitis because it is usually self resolving. Chronic bronchitis. This form of bronchitis is chronic and usually due to chronic exposure to chemicals which damage the lining of the bronchial tubes. It is a form of chronic obstructive pulmonary disease in which the bronchial tubes produce excess amounts of mucus. Smoking is the most common cause of chronic bronchitis. The doctor can diagnose bronchitis by assessing your symptoms as well as listening for wheezing sound in your lungs using a stethoscope. If the infection is bacterial, your doctor may prescribe an antibiotic. Otherwise your doctor may likely conclude a viral etiology and may just prescribe an inhaler for the wheezing along with cough medicine, Ibuprofen, and Tylenol for discomforts. Pneumonia is an infection in the alveoli, or tiny air sacs (which make up the lung tissues), in different areas in one or both of the lungs. This infection is caused by bacteria or virus. This infection is commonly spread through the air (by coughing or sneezing), although it can also occur when bacteria or virus in the nose and sinuses spread to the airways and then the lungs – i.e. when a sinus infection progresses to bronchitis and then pneumonia. Both acute bronchitis and pneumonia have the same symptoms of coughing, shortness of breath, and wheezing. The difference between acute bronchitis and pneumonia is that in pneumonia, there are fever, chills, body ache, feeling ill, and decreasing energy. This is because most pneumonia is bacteria, and bacteria usually present with fever, chills, body ache, and feeling ill. Pneumonia carries dangerous risks and complications such as sepsis (bacteria in the blood stream), respiratory failure, and sudden death. This is why pneumonia cannot be taken lightly and must be treated with a week long course of an antibiotic and an injection of stronger antibiotic for a few days until the patient turns the corner for the better. Pneumonia can be prevented by treating sinus infection and bacterial bronchitis before the infection travels further into the lungs tissues and becoming pneumonia. Vaccination to prevent pneumococcal pneumonia, the worst kind of bacterial pneumonia one can get is one very important immunization – especially in adults older than 60 and people who are immunocompromised. About one million people are hospitalized every year due to pneumonia – about 50,000 of which ultimately die from complications of the disease. Coughing up discolored phlegm. Clear to cloudy is considered normal, while yellow or green is more concerning. If you have any doubts at all, do not hesitate to consult a doctor to at least rule out a potentially dangerous condition. The friendly staff at Medallus Medical can devise the right treatment plan for you and help you to feel better sooner.